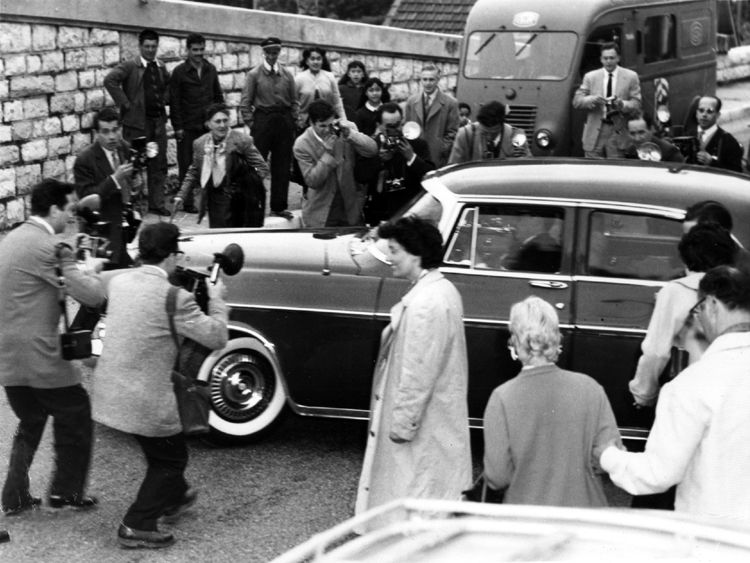 Cameramen block the road to halt this limousine in which Prince Rainier III and his fiancée, actress Grace Kelly, are riding April 13th. After some 50 photographers formed the barricade – some even lying down in the road – in order to take pictures of the Prince and Princess-to-be in their first public outing here, the sovereign’s slow burn exploded in an angry uproar. For their “intolerable maneuvers,” quoth the Prince, the Prince’s Press Chief announced, cameramen will be banned from the civil ceremony and a garden party, both scheduled at the palace on April 18th. These were the only palace accesses that had been granted to the photographers.